Don't lose your bags... labeling and identifying your luggage just got easier! Laminate luggage tags easily and inexpensively without heat or special equipment. Position business cards, ID information, special bright color cards inside protector, peel back protective liner and seal. Includes attachment straps. 10/PK. Hi, I'm John with C-Line and today we're going to talk about our Cleer Adheer Luggage/ ID Tag kit. Create luggage and ID tags easily and inexpensively with this Super Heavyweight Laminating kit. The kit comes complete with tags and straps to make sure you have everything you need to create luggage and ID tags. No heat or special equipment is needed and the pre-printed instructions make it quick and easy to use. 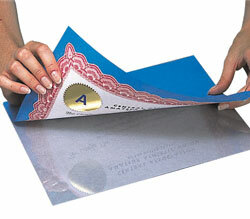 Here's all you do; open the film and position your information, card, or ID on the clear surface. Now just loosen the liner and roll the adhesive film slowly over the card, while you press and seal. Finally, attach one of the straps like this and you are finished. The next step is placing the tag where you want it. First thread the strap through the handle or wherever you're attaching the tag. Now open up the strap wide and feed the tag through the strap. Pull the tag through and secure. The Cleer Adheer Luggage/ ID Tag kit lets you create hanging tags that are waterproof and tear-resistant. Use them to label and identify your luggage, briefcase, craft items, backpacks, and more. There are hundreds of uses for this versatile item in your home, school, and business. Order yours now! That's all we have for today. I'm John with C-Line. Thanks for watching.